We’re getting ready to go on vacation, so I decided to make some yummy cookies to take with us on our trip. I thought I’d share about how I use sprouted flour to make cookies, since they can be a healthy, easy, and delicious snack. Every week or so, I sprout a jar or two of wheat berries so that I have some on hand for cookies or muffins. 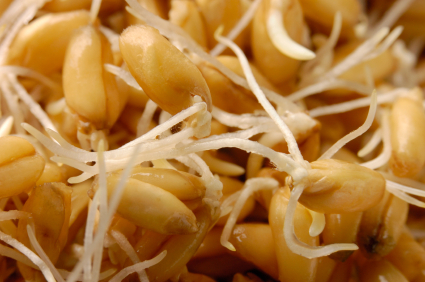 Sprouting wheat is so easy! Just fill a jar about half full of wheat berries, then cover with filtered water. Screw a special sprouting lid onto the jar. Later in the day, tip the jar over the sink so that all the water drains out. Several hours later, fill with filtered water again, then tip it over to let it drain out. Keep doing this several times a day until you see small sprouts. It doesn’t take long in this warm weather — maybe 2 or 3 days at the very most. When you see sprouts on your wheat, empty them out onto a cookie sheet. Spread them out evenly, then pop them into a warm oven (approximately 180 degrees). Keep them in the oven until they’re very dry and crunchy, about one day. (Oh, they smell so good!) Finally, put them back into a clean jar, and put them into the refrigerator. When you need flour for a recipe, simply run the dry sprouts through a grinder or whiz them through your blender. This flour is delicious! The best part is that you can use it in any recipe calling for regular flour, from muffins and cookies to pancakes, quick breads, and more. Mix all these ingredients together. Take a spoonful of dough at a time, roll it through white sugar (you could skip this step if you wanted), and place each ball of dough on a cookie sheet. Bake at 375 degrees for 10-12 minutes. Cool on a baking rack. 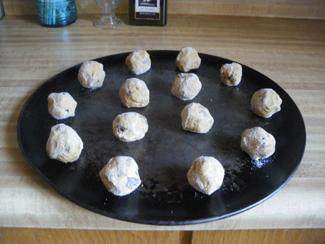 Depending on how big you make your cookies, you’ll yield about 3 dozen cookies. *Note: If you click on the link for sucanat, you’ll arrive at Amazon. You could certainly buy sucanat there, but for $3-something a pound? Probably won’t make too many cookies! I buy sucanat in bulk from Country Life. Check to see if you can buy it in bulk from a co-op near you.